Pacy winger Lloyd Dyer will be given time to get up to speed after signing a deal to the end of the season on Monday. 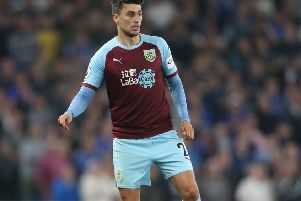 The 33-year-old joined the Clarets as a free agent on Monday after leaving Watford last month. But he won’t come into consideration for Saturday’s game with Rotherham United at Turf Moor, or Tuesday night’s visit of Nottingham Forest, as he is assessed by the sports scientists at the club. Dyer ended last season on loan with Birmingham City, and didn’t made a senior appearance for the Hornets this term after his return, and Sean Dyche explained: “He’ll probably take 10 days to get up to speed. “He’s not played a lot of football this season, and although he has been training, that has been more sporadic the last couple of weeks, so we’ll give him 10 days, three days with the sports science lads, and next week he’ll be training and we’ll try and get him a game. Dyche was pleased to see how hungry Dyer is in discussions about the move: “He’s not been brought in to replace, he’s been brought in to challenge and add to that. “He’s got experience, and one who fell out of contract, and he wanted the challenge. “He knew about us from his time in the Championship and is aware of what we’re about, and when we made contact, he spoke very positively about coming here and the challenge. “He knows we’re doing well and have good players in the wide areas, but challenged himself. Burnley had looked for another wide player in the January transfer window, but failed with an offer for Brentford’s Alan Judge, while Spurs’ Alex Pritchard, having been set to make a loan switch, decided at the 11th hour to stay in the Premier League with West Brom instead. So, is Dyer the final piece of the jigsaw? Dyche said: “You have got to be flexible, that’s the nature of football. “This deal came our way, and we’re flexible on ins and outs going forward. Dyer may be looking at next Saturday’s trip to Bolton Wanderers for his first involvement, and Dean Marney will again be unavailable tomorrow with a calf problem. There is better news as Ashley Barnes steps up his return from a cruciate and medial knee ligament injury: “Ashley Barnes is making good progress still. Burnley entertain the Millers tomorrow, with Neil Warnock at the helm for his second game after taking over from Neil Redfearn last week. Dyche is an admirer of Warnock, and said: “He’s a wily old fox, a seasoned campaigner. “I have a lot of respect for him. “If you manage over 1,000 games, you deserve respect! “He knows his way around the game and the division, and we have to make sure we’re ready for any reaction from his players. Rotherham are again fighting for survival, but Dyche takes no-one lightly: “Burnley fans have come to realise, expectation is one thing and reality is another. “They know the challenge, I don’t think they take any games for granted. “We know we have to perform.